Under its livelihood program, Cheshire Homes aims to improve access to livelihood opportunities for people with disabilities through skill development, quality training and support so as to ensure people are able to obtain work or start a business of their choice. The targeted beneficiaries are adults with disabilities from under privileged section of society. To identify people with disabilities, train them as per their shortcomings and try to place them such that they lead a life of dignity. To build skills for the people with disabilities to meet the requirements of the Industry and also to meet their livelihoods. To provide an awareness on disability to the corporate so as to ensure equal opportunities are provided to the persons with disabilities. To provide a platform so as to facilitate interface with job seeker and job provider by better matching the needs of both. To ensure disabled people have access to career counseling, work placements during their training and are provided with employment . Identify of disabled youth in need of employment through career guidance camps,networking or reference and provide counseling and career guidance to make them select the right career. Trainings range from IT/ITES/Non IT/Employability trainings/English to soft skills. Follow up on placed candidates will be done so as to ensure the effectiveness of the training and placements done. Computer (IT Training): Duration 3 months. Training will include Basic of computers, MS Word, MS Excel, Typing, using the internet etc. Sector specific training: Duration 3 months. Trainings on Hospitality /Retail Management will be provided to candidates based on the individual assessment, observation and interests. Need based training: Duration 1 month. Training provided as per the needs of the individual. Training includes quantitative aptitude, logical reasoning, and verbal reasoning. Foundation Training /Soft skill trainings: Duration 1 week – 1 month. Provided to all candidates includes English training, soft skills, communication such as replying to email, formatting an email, drafting letters etc. Your donation of Rs. 5000 will be used to provide employability traning for a needy disabled person as described above. 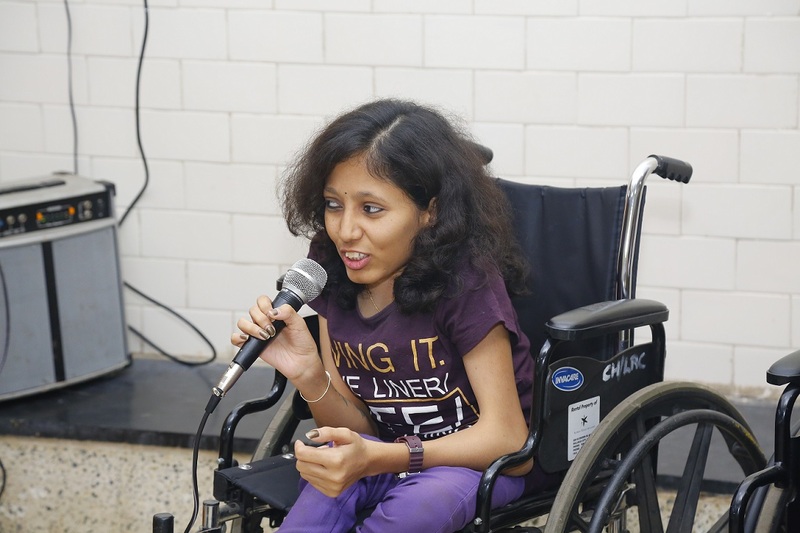 Faiza is a 10 year old girl has locomotor disability due to congenital condition of her spine known as ‘Spinal Dysraphism with Paraplagia’, which renders incapable of using her lower limbs. Her father Aziz is a school bus driver, while mother Nasima is a housewife. Faiza was identified in the year 2011 by the project and at that time she was not able to move or control her body movements and posture. She was at home all the while, since parents did not know what to do with her and could not afford any treatment at the time. Post the assessment, Faiza immediately started to receive physiotherapy at the outreach centre at Behrambaug. During the course of intervention, Faiza was simultaneously supported by the project for getting a Disability certificate, public transport travel concessions (Road and Rail) and several other clinical/medical examinations. Her physical condition started to improve remarkably; she was able to sit for longer durations with correct posture. Today she can stand with support, and uses wheelchair to move about. Despite family’s poor economic condition her parents were very supportive of her, and enrolled her into a school nearby. However, due to disability and poor health, she used to eb irregular in attendance. She was very shy and would not interact with others. Hence, the project further got her to be part of the Children’s club, which was a turning point. She has gradually become confident and very social. Her improved physical condition with therapy at the centre encouraged the project staff to get her enrolled her into another school that it had been working with on inclusive education. Today, Faiza goes to Mariam Public English High School, a mainstream school in Behrambaug area, and is in 4th class. She has settled well and receives the needed support from her teachers and other children. She is very regular and can comfortably sit through several hours in the classroom. Faiza was also supported for tuition fees for the initial period of six months.